It's common for some Mailchimp users to create a campaign with HTML from a website. For example, you may want to do this if your web designer uploaded the HTML for your campaign on their website. 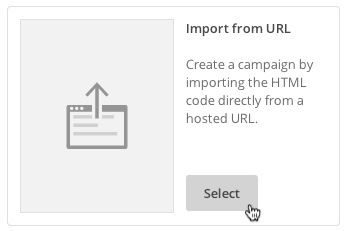 To create a campaign with HTML from a webpage, you'll use the Import from a URL option in the Campaign Builder. In this article, you'll learn how to import HTML from a webpage into your Mailchimp campaign. When importing from a URL, all images must be hosted on a public server, and all links should be set as absolute paths that point directly to that public server. You can also use the Content Manager in your Mailchimp account to host your images and insert image URLs into your website's HTML code. After you import your URL, campaign changes or edits will need to be made in the HTML code of the webpage you imported. Updates to the content hosted on the URL will be included in the final email. If you need help coding or customizing the HTML code you import to Mailchimp, check out our Email Design Reference, or contact your developer or a Mailchimp Expert. On the Template step, click Code your own. Type the URL where your email design is located in the Campaign URL field. Your campaign will display on the left side of the screen. Check the Automatically Add Footer box to add a footer that contains our unsubscribe link and other required information to your campaign. If required, click Change Image next to the Mailchimp MonkeyRewards badge to change how the badge looks in your campaign. Make sure you preview and test your content thoroughly, and reach out to a developer or Mailchimp Expert if you need help editing the code. 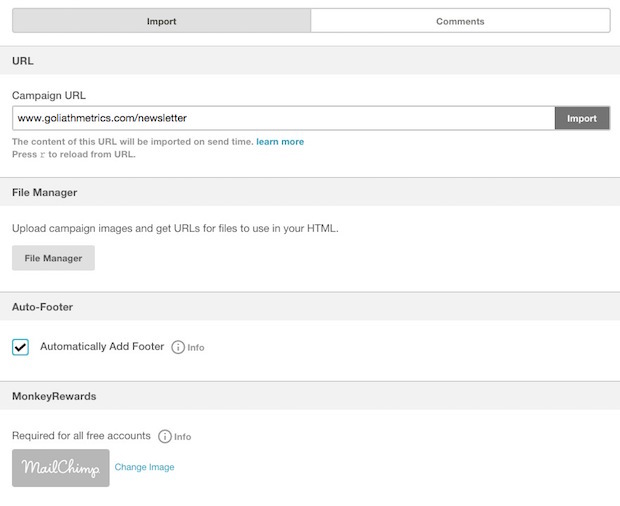 To create your final campaign, Mailchimp will add the content from your URL at the time of send. Any changes you've made to the content hosted on the URL prior to sending are included in the final email that sends to your list.